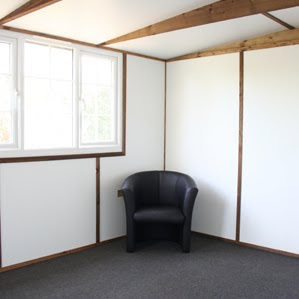 Another new garden office blog to take a look at, Garden Office Expert by Charlie Dalton from Smart Garden Offices. Lots of good photos and, I suspect, plenty of gossip in the future... Above, the interior of their Duo model. Looks lovely, is it warm during the big freeze? That's the question. Love it, great space saving idea too! The Garden Office Expert blog (which is Smarts blog) seems to list a lot of competitors of Smart Garden offices with rather acid comments about the design of them, also saying that they have called in the receivers. Yet all these companies, apparently in receivership have fully working websites and I can't find any reference to the receivers having been called in. Some of them continue to advertise on Shedworking and are showing at Grand Designs in May. I hope that Smart are either mistaken or the other companies managed to sort out their financial problems and that Smart are NOT spreading malicious rumours via their blog! House and from generally available credit reporting services. I'd never be so malicious (or stupid) to make anything up or write anything that couldn't be substantiated. Many garden office companies request a deposit from customers (Smart included) so i believe the financial well being of the supplier is of significant importance, especially in respect of ongoing warranties. Sure, I'm not a big fan of " cedar box" garden office designs - but that's mere opinion. Forgive me if I'm an enthusiastic believer in our own, prettier and more robust, products - but that's what i believe a personal blog is about. I'm an active supporter of creditable competitors whose product or business adds to our sector and improves customer choice. Our twitter account @officeingarden is testament to positive comments of competitors such as swift, hudsons and rotunda over the last few months. Absolutely awesome blog for innovative garden rooms with great space. I went thru the blog “Garden Office expert”. It is truly a good blog and I grabbed lots of information regarding garden offices. I wish I have an office like to work peacefully. This is an amazing blog. Thank you.